SAN DIEGO—On March 14, boaters cruising around the outskirts of San Diego Bay reported a distinguished buoy missing from the navigable waters of the Pacific. Measuring 8 feet in diameter and 26 feet in length, the San Diego Approach Lighted Whistle buoy was nowhere to be found. Following the intricate investigation by the Coast Guard, it was determined that the aged steel marker sank approximately 80 feet. Weighing more than 5,000 pounds, the object retained an influx of water before sinking to the ocean floor, where it currently rests on its side, according to Bannon. “It’s one of the reasons we haven’t recovered it yet,” he said. Excavation of the buoy, which was serviced about three weeks prior to the incident, will be placed on hold for the time being. Bannon said a buoy tender berthed in San Francisco, named Aspen, is the only haul on the West Coast that can manage that kind of weight. He said he expects the mission to be completed in September, but noted that information regarding the buoy’s disappearance was recently posted in the Coast Guard’s Local Notice to Mariners. 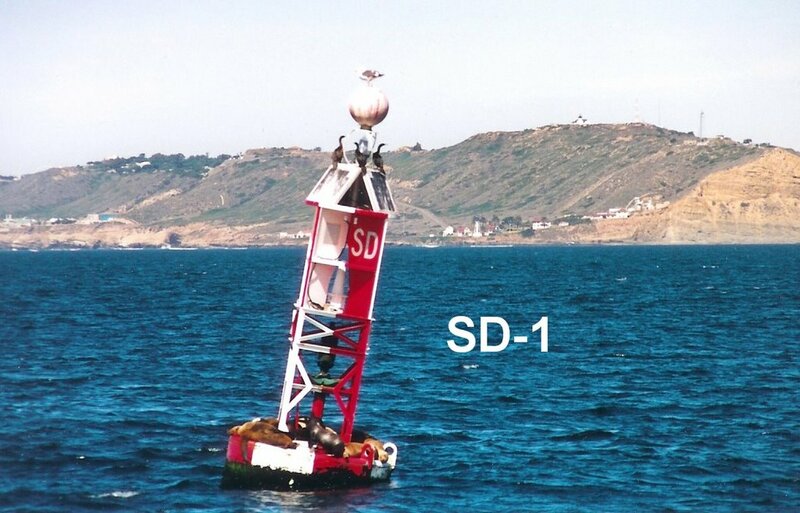 The buoy, labeled as a safe water mark, was located southwest of the jetty, about three miles off the tip of Point Loma. Bannon said it was outfitted with a light, which flashed Morse alpha, and a spherical top water mark. The Coast Guard recently established an AIS signal for the buoy about three weeks after it sunk. However, without a proper AIS receiver, recreational boaters would not pick up the location. For now, Bannon said a reevaluation process will begin to determine if the Coast Guard deems the buoy’s use worthy of reinstallation. According to Bannon, the Coast Guard’s main concern is always safety, but the recent discontinuation of buoys in Glorietta Bay and San Clemente Island has made the agency reconsider their usefulness. Still some boaters aren’t thrilled with even debating a possible decision. Kinner said navigation at night in the area in which the buoy sank includes a multitude of kelp beds. She added that locating the beginning of the channel can be difficult for unseasoned boaters. NOAA-sponsored listening sessions, titled “Future of Navigation: 21st Century Waterways,” have been held throughout the country to examine and discuss multi-federal agency initiatives to implement such technologies throughout the waterways. In Long Beach, June 17, representatives from the Coast Guard, the U.S. Army Corps of Engineers and NOAA will meet to express their needs to improve safety and efficiency at sea. Bannon said the Coast Guard will gain feedback through public input before making a decision. He added that the agency seeks to look at ATONs at a holistic level, taking into account budgetary concerns and tax payer benefits.